The key issue with using Balanced Scorecard is that it can be hard to motivate people to use it. The person wishing to implement Balanced Scorecard faces the challenge of convincing top managers to start using this concept. More over, they must insure that all other stock-holders are in agreement, as they need to play an active role in the design and implementation of each process. 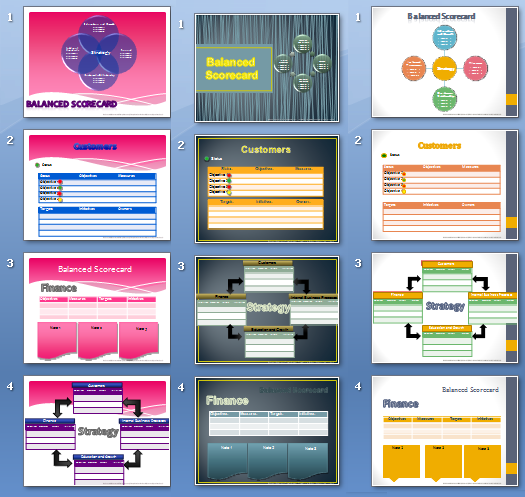 As with any presentation, your Balanced Scorecard presentation should be a good mix of quality content and design. Before you go into any details, you should start out by presenting the general ideas that make up The Balanced Scorecard (1-2 slides). In order to demonstrate the importance of Balanced Scorecard, present your audience with some success stories about this concept. Visit this link to find some facts about Balanced Scorecard that you can add to your presentation. Add Key Performance Indicators (KPIs) to your presentation. You won't be able to fit all of the KPI's you'd like into just one PowerPoint presentation. Presentations are designed for presenting key ideas, not for giving information in detail. Your presentation should focus only on the most important indicators and perspectives. Aim to show your audience the benefits of Balanced Scorecard, as quickly and succinctly as possible. 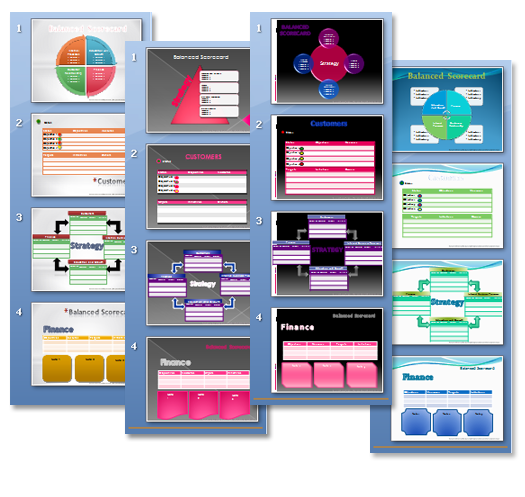 By now, you may have already found some visual designs for your Balanced Scorecard presentation. They may look good enough, but it's likely that once you begin adding your data to the template, you'll find it doesn't work. Balanced Scorecard data simply doesn't fit into small tables. By utilizing ready-to-use Balanced Scorecard templates, you can save a few hours of professional designer work. It will also save you the trouble of having to explain to the designer what Balanced Scorecard is and how it is important to represent data correctly. Get 10 templates, 4 slides each in version 2.0 (check the content below) + more that 40 different slides from popular version 1.0, in total more than 80 different slides with PowerPoint templates designed specifically for the Balanced Scorecard. 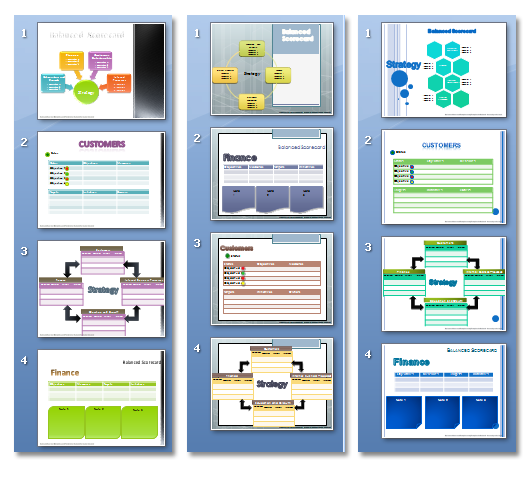 Inside BSC Presentation Templates you will find version 2.0 (40 slides) and version 1.0 (more than 40 slides) of templates. These are completely different templates. Balanced Scorecard has become extremely popular due to its simplicity and efficiency. At the same time, it is possible to say that BSC just looks simple at a first glance. In reality, implementation process is quite complicated and full of hidden rocks. Just like any other tool. Balanced Scorecard requires particular skills and knowledge that top managers and sometimes even ordinary personnel need to acquire. The best way to fail in BSC implementation is to use this system without being aware of what is actually going on. For this reasons, BSC education, training and coaching has become very important. In fact, lots of companies and top managers are seeking reliable and solid education, as well as additional materials and tips on effective BSC usage. Self education is also a good option. However, in order to achieve positive results it is really necessary to find effective studying materials. 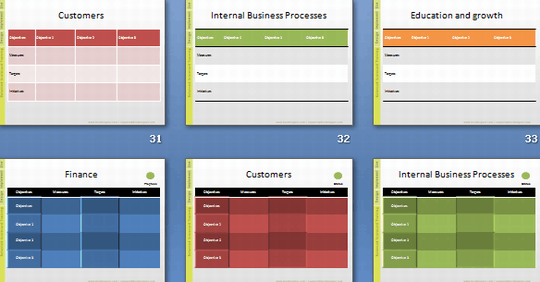 Balanced Scorecard templates are now widely used for several reasons. First off, such templates are kind of frameworks. It means that managers will have ready to use charts and schemes which they should fill with information. As a rule such templates even include strategy maps, BSC categories with blank spaces for real key performance indicators. What is more important, there are even cause and effect ties between KPI which makes it possible to see interrelation between BSC categories and measures. Advantages of using BSC templates are quite obvious. Firstly, this is an excellent opportunity to create the first sample scorecard and see how the system works and what’s required for a full scale implementation of BSC. Secondly, this is an excellent learning tool since managers with no BSC knowledge can practice in so to say “demo” mode. As a rule, BSC templates come with additional materials, sample scorecards, sample KPIs etc. these materials will help aspiring managers master Balanced Scorecard concept. As they say, it is better to try something once than read about it for hundreds of time. Use of BSC templates is a step from theory to practice. Sure, implementation of BSC in large organizations requires monetary investments, however, why not first investigate the issue, and create the first sample BSC to witness the real power of Balanced Scorecard. Sure, it is possible to create BSC templates with own hands. However, this will take quite a long time. For example, if one needs to make a presentation of BSC to the company top managements, BSC templates are a perfect solution in this sense. All BSC templates are supplied in a widely used file extensions (power point slides and pdf docs) so there should not be any problems with opening the files and making an effective presentation. Users will be able to insert own texts, comments, headlines and figures. Thus, little time is needed to personalize such a BSC. As a result, it is really possible to create company scorecard within a short period of time, probably several days. For a moderate price, managers and strategic planners will acquire an effective tool which they will use for the company benefit.